Waste should not necessarily mean spoil or totally without value but be regarded as something that is useful but applied in the wrong location or wrong form. 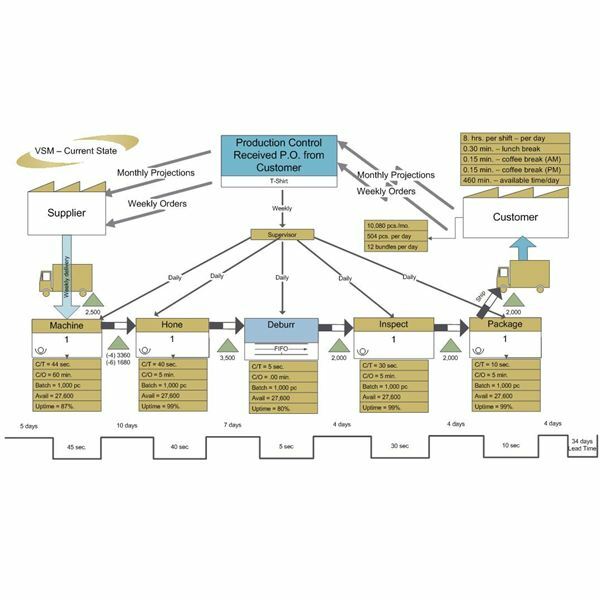 Value stream mapping helps in depicting the processes in its current state — how they run and how much material and work hours are being utilized from point to point; regardless of value or no-value added to the product. 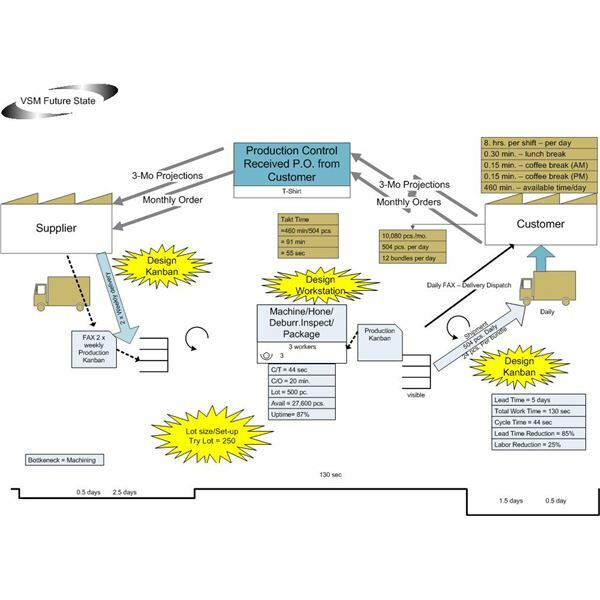 The objective in performing a lean manufacturing value flow analysis is to improve a set of work processes in ways that would keep customers highly satisfied. The specific product or group of products that basically employs the same work procedures; that way, improvements will cover the entire block of steps required in producing a particular item. The client’s concern or conditions considered as more advantageous on his or her part as a reseller. Typically, most initiatives for improvement stem from the client’s request or complaints. The scope of the work progressions to be analyzed in order to avoid over-optimizing the plans for improvements. All pertinent information related to the methods and procedures, i.e. the customer, the supplier, type and quantity of materials and man-hours employed. Ensure that all data have been validated and properly measured. 1. The customer expects a daily delivery of 504 pieces, but the delivery of the ordered goods has to wait for the completion of a 2,000-piece batch. Moreover, the total production time it takes is 34 days. As a result, the customer who resells on a wholesale basis tends to run out of stock. 2. Shipment of raw materials coming from suppliers arrives once a week until it meets the projected monthly requirement of 10,000 pieces. Note that the production unit uses more than the projected quantity of materials yet produces less than what was projected. In fact, 2,000 pieces delivered per week is equivalent to only 8,000 pieces per month. 3. There are five workers involved in the processing, one for each step that takes less than a minute to complete. Machine cutting and sewing takes 10 days, while honing or refitting the materials to meet the exact body measurements takes 7 days. Obviously, there is also a lot of time wasted during production. Lean discipline focuses on the objective of improving the current flow of materials, time and communication of data–by evaluating the values added to each process. That way, the areas and instances where wastes occur can be pinpointed and eliminated for purposes of process improvement. 1. Comprehend that the amount of time it takes to complete each step equates to labor cost, which the customer will pay in terms of product price. Hence fewer man-hours spent to perform a process means less value added to the product's selling price. Aim to identify the stage when the period allotted could be shortened by the idle time. Determine idle time as that which elapsed, but did not bring any changes in the material processed. Analyze the time schedules of those involved in the production stages by looking at the whole block instead of focusing on a single step. Analyze idle time and how it can be utilized to finish the entire process. It would also be advantageous to review individual skills and the ability to perform other types of tasks. 2. Study the smoothness of the flow, which denotes that there is less time spent to move materials or equipment. Lean flow is all about finishing a task in the shortest time possible without affecting or hampering the main line of work. Consider the work space and the time it takes to gather and transfer a finished batch on to the next workstation. Count the number of times that counting, bundling and transferring each batch happen in the entire production stage. Study the floor plan of the working area and how work stations can be best arranged with the objective of eliminating transfer tasks. Eliminate time spent waiting for a batch to be completed before proceeding. 3. Make sure work performed is not duplicated, which most workers are constrained to do if the finished goods fail to meet quality control inspection. Establish critical points where quality should be pre-inspected before proceeding to the next processing stage. Reducing time to unravel and redo work that does not meet the standards likewise reduces time wasted for performing work on a product that will eventually fail to pass quality inspection. 4. Understand the principle of “pull-through" processes as a better alternative to “push-through" procedures. This means there is less need to communicate by harnessing the efficiency of automation. Evaluate the cost of investing on software for virtual designs and automated calculations, as well as CAD (computer-aided design) or CAM (computer-aided manufacturing) equipment. Take into account the possibility of achieving zero-errors through the help of computer technology. Calculate the speed and accuracy with which tasks can be accomplished in greater quantities. A careful study of the current state map for the garment manufacturing example shows that each worker is responsible for a single step. Hence, any lag or retardation in the progress of one worker can slow down the progress in completing an entire batch. Most garment manufacturing companies use "kanban" techniques as their means to achieve lean production. This commences from the time it takes for raw materials to be delivered and from the production's commencement at pattern-making stage. It is at this point of production that instructions are clearly marked for the cutters and the assemblers. However, the markings and measurements have to be precise because they serve as guidelines for the cutter and the stitchers. This is also where computer-aided designs and computer-aided cutting machines are most useful. "Kanban" is also known as the just-in-time method, which adheres to the practice of supplying raw materials in quantities that are commensurate to the expected time that a batch is completed. Hence, moving the workers as close to each other as possible and up to the extent that floor space allows supports a team-coordinated workflow process. The next worker in line can check the work passed on to him or her before proceeding; any adjustments or alterations can be made before further work is performed. Cross-training the workers enables each one to discern any errors, as well as allow any one of them to perform any work process. As an example, cutters and stitchers are trained to understand the markings–e.g., black-marks are for outer layers while blue-marks are for the lining, as well as any other coded instructions to be uniformly observed. Explore these possibilities and plot them on a new value stream map, to be labeled as the “future state map." Calculate the values-added, the non-value stages and the time-allotments eliminated. Highlight the improvement plans where physical changes, trial-runs and workshop are required. That way, plans for implementations are properly laid out to ensure that deployment procedures will run as smoothly as possible. View an enlarged image of the sample future state map and notice that projections for purchases cover a 3-month period. The intention is to give the supplier enough time to meet the company’s new demand. The monthly order of 10,000 pieces should be delivered twice weekly. The objective of this future state map is to meet the customer's requirement of receivng a daily delivery of 504 T-shirts. Hence, if the present supplier cannot deliver the manufacturer's new requirements, it would be a wise move to find a supplier who can. Doing so eliminates a number of hours wasted waiting for the raw materials to arrive. The work station will be designed and arranged in a way that will allow all workers access to the equipment they need. The aim is to eliminate the transfers and bundling tasks except for the packaging stage. Workshops and related hands-on training will be conducted to enhance the skills and knowledge of the workers. Test a lot size of 250 pieces to determine the average time, the materials and the equipment required to complete the entire work processes. Standards for quality should be the main guideline for establishing the standard time by which a piece of garment is completed. Take note of all errors and determine the critical points at which they occur. Implement this as part of the critiquing procedure during each step. All these steps may seem daunting and even far-fetched for some. However, these lean manufacturing techniques have been proven as effective by those who have established an edge over their competitors. Screenshot images of sample Current and Future State Maps were created by the author for this aritcle. .